Download our 2019 Membership Benefits Package Here! To be a leader in the improvement and development of a strong Yellowknife business community with a diversified economy and sustainable growth. Members are lsited in our online business directory on our website. Members are listed in our annual magazine, Yellowknife Chamber Insider. Not only do we provide dozens of business referrals each year, we choose member businesses as our suppliers whenever possible. E-blasts: Distribute information about your business, a product or service, or an upcoming event to over 700 subscribers using our e-blast service. E-blasts are $125.00 + GST and are only available to Chamber members. #ShopYK : We've partnered with the City of Yellowknife to promote Yellowknife businesses and to encourage consumers to shop local. During the #ShopYK campaign, for every $20 spent at participating businesses, shoppers receive a stamp on their #ShopYK passport. Once 30 stamps have been collected, completed passports can be entered into our grand prize draw for a $3,000 cash prize. In 2018, $816,000 was spent locally through the #ShopYK campaign. Spring Trade Show: With 185 exhibitors and 8,000 attendees, this event is a wonderful opportunity to promote your business. Join us on May 11th and 12th at the Yellowknife Multiplex. Our floorplan map and registration form can be downloaded from our Spring Trade Show webpage under the "Events" tab. Throughout the year, we facilitate educational training and professional development opportunities for business owners and their employees. This is accomplished by using a variety of resources, from nationally renowned speakers to local knowledge powerhouses. Small Business Week: Join us October 22nd and 23rd for our third annual Small Business Week Conference. Our 2018 conference featured presentations on social media marketing, reconciliation, procurement, box 32 "travel in a prescribed zone", and more! Trailblazers Mini-conference: These events aim to empower those who have been considering entrepreneurship but have not made the leap, and to shine a spotlight on the exceptional and influential women in business in our community. Building Business Capacity in the North: In partnership with government and economic development organizations, we identify the Yellowknife business community's educational needs and facilitate subsidized training. Programming varies from year to year, and has included BDC's Marketing Booster 2.0, Financial Management, and Human Resource Dynamics courses, offered at a 90% subsidized rate. Other courses have been offered fully subsidized, including Crowe MacKay's Understanding Financial Statements 1 & 2, and their all-day Small Business Basics course. Lunch and Learn: Members have an opportunity to share their expertise in an informal setting by hosting a Lunch and Learn event. You provide the topic, we provide lunch. Please contact us for more information. Networking is an important part of doing business. Our events provide you with an opportunity to connect with potential suppliers, customers and fellow businesspeople! Business After Hours: Hosting a Business After Hours event provides you with a great opportunity to showcase your business, products and services. Chamber staff will assist you in planning and promoting the event. Please contact us for more information. Business Club Luncheons: Hosting a Business Club Luncheon provides you with an opportunity to do a presentation to the Yellowknife business community. Chamber staff will assist you in planning and promoting the event. Please contact the Yellowknife Chamber of Commerce for more information. AGM & Free Business Lunch: Want to learn more about the Yellowknife Chamber of Commerce? This is your opportunity! Join us for our Annual General Meeting, where we elect our Board of Directors, present our financial statements, and show you what we've been up to. Immediately following the AGM is a free members appreciation lunch. Business Award Gala: Every October during Small Business Week, we honor and celebrate the Yellowknife business community. This event includes dinner, an awards presentation, and evening entertainment. Only Chamber members can be considered for one of our 10 annual awards. Travel Program: Ask any of the travelers on our 2017 trip to China, or our 2018 trip to Peru - there's no better way to build solid business connections and to meet new clients, suppliers, and friends! 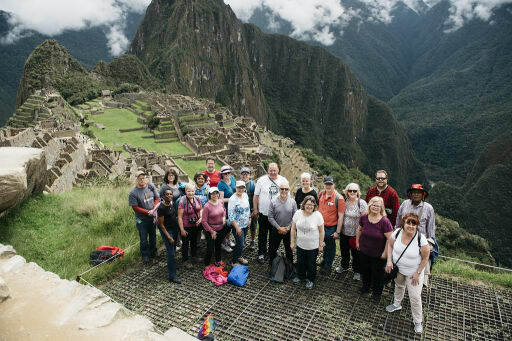 In April, 2018, we took 44 Yellowknifers on a 10-day excursion through Peru, visiting Lima, Cusco, and one of the New Seven Wonders of the World, Machu Picchu. In April, 2019, we're heading to Bali, Indonesia! Stay tuned for our 2020 destination and special members' pricing! Discounted Flights with First Air: Chamber members receive 20% off any fare (excluding seat sales), for travel within the First Air network. Contact the YK Chamber for more information. Notary Public Services: We provide free notary services to our membership. Please call ahead to ensure availability. Notary services are not available to non-members. Our membership with the Canadian Chamber of Commerce allows us to share their value-added programs with our membership. Enjoy preferred rates on credit card processing with First Data, fuel discounts with ESSO, and savings on shipping through UPS. 3.5 Cents/Litre Fuel Discount: Chamber members who sign up for the Esso Business Card will receive a 3.5 cents per litre discount on fuel, regardless of volume. With access to nearly 1,800 ESSO Stations in Canada and 10,000 Exxon and Mobil stations in the US plus powerful online account tools, the Esso Business Card gives you flexibility and convenience. Contact 1-888-330-2419 for more information or to sign up. UPS Members Benefit Program: Members can take advantage of the following discounts with a new or existing UPS account. Small business services - 40% off shipments within Canada and to the United States, and 40% off shipments to worldwide destinations and imports into Canada. Freight services: Savings start ay 75% off heavyweight, LTL (Less-Than-Truckload) shipments over 150lbs. Also includes 30% off brokerage entry preparation fees and free automatic daily pickup (weekly service charge waived) and more! Call 1-800-MEMBERS (1-800-636-2377) for more information.